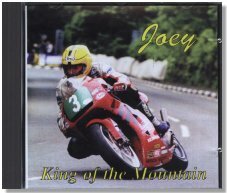 Local singer, Dickie Kelly has released a CD featuring a song which he has written and performed, entitled "King of the mountain", a Tribute to Joey Dunlop. Dickie sings and plays guitar. Eric Kelly ably supports him on keyboard, Martin Burns on guitar, with the haunting sounds of the harmonica provided by Ken Crellin. The style might best be described as country, but the song, thoughtfully worded and beautifully sung with great sensitivity, is set to the traditional Irish folk-tune, The Fields of Athenry. This is something that will appeal to many who are not even bike fans, and "will make grown men cry", such is the power of the emotions that it expresses. Peter Kneale "The voice of T.T." provides a written tribute to Joey in the sleeve- notes, and a donation from every C D sold will, appropriately, be made to the Helicopter fund. The CD is available from a number of outlets around the island, but can also be purchased by contacting Dickie Kelly on 01624 801396.